Had to look closely in the background to realise what it really was. What a cool hat the Boy has! Looks like a fun outing! I used to love riding on the model trains in our local park. he's looking the part there, now where are the pics of you all sitting on that little train?! Better watch out Mister, someone's after your job! 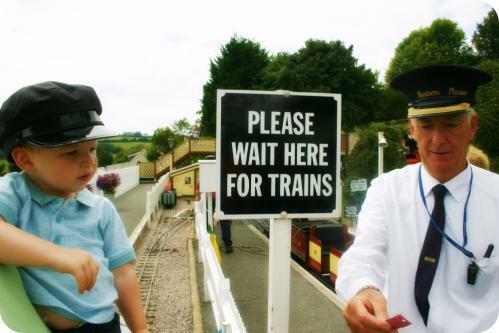 The Boy is being a Very Useful conductor there. He's looking very intently at what the gentleman is doing. Drinking everything in no doubt. That is brilliant! The Boy looks so chilled out. Brilliant – we have one of these local to us, my little man loves it! Ahh, that's lovely. Is he driving the train? What a great little conductor! Looks like a fab day out!